Had you been around in the middle of the 19th Century and taken the opportunity to visit any one of the burgeoning number of natural history museums, you would not have found fossils of dinosaurs dominating the main galleries. Prior to the American “bone wars” that led to the naming and describing of a number of iconic dinosaurs from the western United States, it was the many and varied prehistoric mammals that held centre stage. 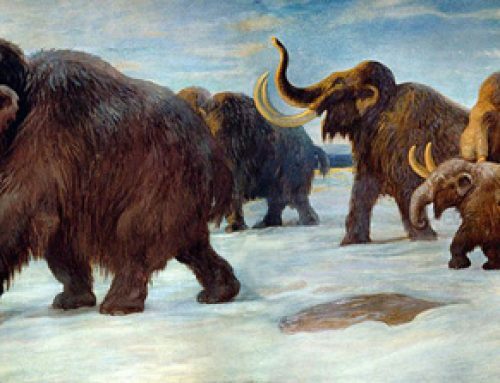 Visitors would have marvelled at the fossilised bones of giant sloths, the antlers of immense ancient elks, bizarre elephants with downward pointing tusks and long-extinct cats with sabre-teeth. Today, we have a much better understanding of the animals that came to dominate the Earth after the demise of the dinosaurs, more knowledge than the Victorians would ever have imagined. These prehistoric beasts, their evolutionary history, diversity and variety are documented in a new book by Princeton University Press – “The Princeton Field Guide to Prehistoric Mammals”. Written by American palaeontologist Donald Ross Prothero (Natural History Museum of Los Angeles and Professor Emeritus of Geology at Occidental College) and beautifully illustrated by renowned scientific illustrator Mary Persis Williams, this publication is a “must have” for academics and for fans of fossils as well as anyone with an interest in general science. “The Princeton Field Guide to Prehistoric Mammals”. Following a similar format to “The Princeton Field Guide to Dinosaurs”, compiled by Gregory S. Paul (expect a review of the second edition of this excellent dinosaur book shortly on this blog site), the author provides a general overview on the evolutionary history of the Mammalia before moving on to describe in detail representatives of each of the major groups of fossil mammals. Mary’s fantastic drawings are augmented with stunning pictures of key fossils and the easy-to-follow text is supported by numerous cladistic diagrams that help to demonstrate the taxonomic relationships between the different types of prehistoric mammal featured in this comprehensive overview. Highlights include an extensive cataloguing of insectivorous mammals, bats (Chiroptera) and early primates illustrated by a number of detailed images showcasing the exquisite mammal fossils excavated from the UNESCO World Heritage site known as the Messel Shales. Readers can learn how, over time, horses evolved from cat-sized forest creatures to the long-limbed animals of today, or indeed how the ancestry of dolphins and whales can be traced back to hoofed, terrestrials. The primitive whale Basilosaurus is featured in chapter 14 (pp 162-163). There is certainly a great deal to commend this book. Each of the major groups of mammals is discussed in turn, no mean feat, given the great abundance and variety of Cenozoic mammals that are recorded in the fossil record. After all, dinosaur discoveries may make headlines, but as any vertebrate palaeontologist will tell you, the fossil record of the Mammalia over the last sixty-six million years or so is much more complete and arguably, a lot more complicated. It is the little flourishes that appeal the most, those little details that demonstrate that this was a book that has been crafted, with the author and illustrator united in the desire to tell the story of our closest relatives in the tree of life. For example, there is an extensive “Further Reading” section at the end of the book and within the index a handy pronunciation guide has been provided. The closing chapter, (chapter 18), sets out to answer some of the questions associated with mammalian evolution after the Cretaceous mass extinction event that saw the end of the non-avian dinosaurs and many other kinds of giant reptile. The author tackles questions such as “how did mammals diversify after the dinosaurs vanished?” “Why were some prehistoric mammals so big and why have most of the huge mammals disappeared?” These are the sort of questions that may well have vexed those Victorian visitors to museums, such questions still fascinate and Donald R. Prothero skilfully constructs answers, illustrating the points made in support of his arguments with some of the latest research on prehistoric mammals. As to the future, the closing remarks in this 240-page volume, make sober reading. Many mammals are on the brink of extinction, iconic mammals of today, may not be around within the lifetime of the people reading this book. Due out towards the end of November 2016, “The Princeton Field Guide to Prehistoric Mammals” is highly recommended.